Problem: You have to sit down with your team, and work out your performance measures. You want it to be collaborative and fruitful, but you’re dreading it because in the past it’s generally been cumbersome and futile. Solution: You have to do something different. There is a way to design a KPI conversation with your team that is collaborative, and does produce meaningful measures. If you do it well, it can even be profoundly inspiring. What you definitely do not want to do, is brainstorming. Do not brainstorm measures with your team. That’s not the way to be collaborative. Brainstorming is the same old approach you’ve used in the past and it fails miserably at generating truly inspiring and useful measures. If you want better measures, you must use a better approach. A better approach to the KPI conversation with your team has three parts. KPI Conversation Part 1: What is a measure, really? We can’t assume that everyone has the same understanding of what a real performance measure is. For example, lots of people think that milestones (dates by which actions are completed) are measures. Milestones are not measures. Discuss and smash assumptions about what a performance measure really is. KPI Conversation Part 2: Which results matter enough to measure? When everyone appreciates that measures quantify the evidence of a performance result as it is occurring over time, you realise you need to be very clear about what those performance results are. Too often teams will choose too many things to measure. You need to be disciplined and ruthless in selecting the results that are, right now, the most important things to measure. And express those results clearly and measurably. KPI Conversation Part 3: What is the evidence of these results? To have meaningful measures, those measures must be direct evidence of your performance results. Not actions, not causal factors, not spin-off benefits. They must directly quantify the extent to which your results are happening. So as you and your team consider what the measures will be, use a deliberate procedure to design them, and make sure they are written quantitatively. You’ll want to be sure your team is excited about their measures and knows what to do next to bring them to life, so you can start using the measures to improve your results. Don’t lose the momentum once you’ve chosen the measures! 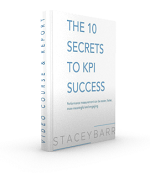 Think about the steps you’ve taken in the past to develop KPIs with your teams. What steps did you take? How well did they work? What could you do differently, to get more meaningful measures?